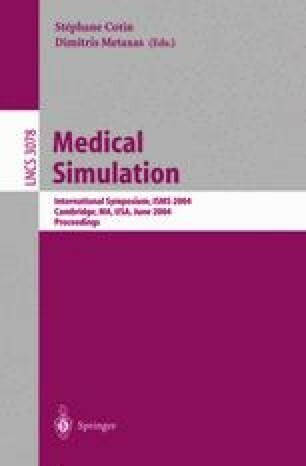 The biomechanical properties of soft tissue derived from experimental measurements are critical for developing a reality-based model for minimally invasive surgical training and simulation. In our research, we focus on developing a biomechanical model of the liver under large tissue deformation. This paper presents the experimental apparatus, experimental data, and formulations to model the experimental data through finite element simulation and also compare it with the hyperelastic models in the literature. We used tissue indentation equipment to characterize the biomechanical properties of the liver and compared the local effective elastic modulus (LEM) derived from experimental data with that from plane stress and plane strain analysis in ABAQUS. Our results show that the experimentally derived LEM matches closely with that derived from ABAQUS in plane stress and plane strain analysis and the Ogden hyperelastic model for soft tissue. We would like to acknowledge the support of National Science Foundation grants: EIA0312709 and CAREER Award IIS-0133471 for this work.